Physical Description Kysaohl is tall and strong. He has sharply defined features and a strong jaw. 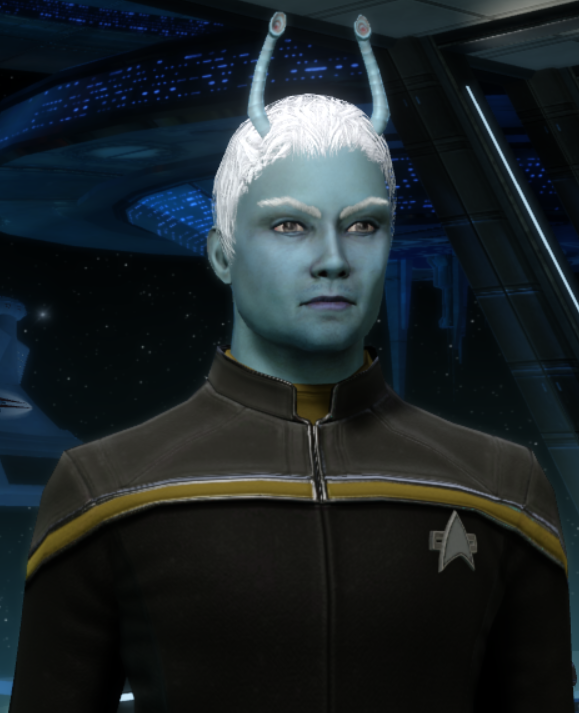 His white hair is kept reasonable short and like all Andorians he has a pair of antennae on his head. General Overview Kysaohl was always tall and well muscled, even with the lower gravity of Luna. He was average in school but excelled with anything physical and he played many sports. He hates bullies and seeing people being downtrodden. Personal History Kysaohl was born, raised and educated in Armstrong city on Luna. He loved playing sports and was very competitive. He wasn't the smartest kid in his class but he was always able to keep up with what he was being taught. He left school at 18 and spent 2 years working in a small restaurant in Armstrong city before joining Starfleet Academy in 2378. While at the academy Kysaohl made many friends and joined the academy football team. His studies at the academy were focused on the security and tactical operations of Starfleet. Upon graduating Kysaohl was immediately assigned to the USS Trident and departed Earth the following morning. Kysaohl spent 7 years aboard the USS Trident and had many experiences during that time. He met Ishreese in 2385 when she was transferred aboard. Ishresse quickly fell for him and Kysaohl soon fell for her too. Kysaohl was privileged to be involved in a first contact mission along with Ishresse, he said nothing, simply acting as protection should she need it, but for him it was an amazing experience. In 2387 Kysaohl and Ishresse agreed to return to Andoria to complete their bondgroup. It was an interesting experience for Kysaohl to visit Andoria for the first time. He was pleased with his ancestral home and was even more pleased when they quickly completed their bondgroup with a pair of scientists who had already bonded. In 2388 the four of them returned to Starfleet and were all assigned to the USS Tangaroa. In 2390 the Tangaroa was sent to deal with a pirate threat near Starbase 194. During an engagement with three pirate vessels the Tangaroa was boarded. Kysaohl led the defense of Engineering during the boarding and was later promoted to Lieutenant JG for his actions that day. In 2394 Kysaohl and his bondgroup were all transferred to Langley Station.